I finished my Comet quilt last weekend after a surprising short time of quilting. 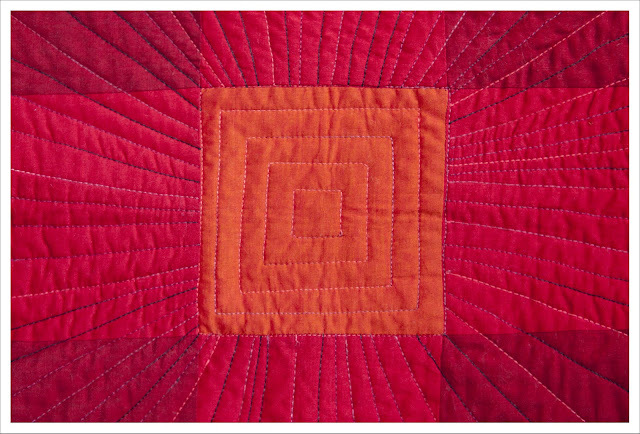 You may remember that my quilting plan was to quilt radiating straight lines from the center (as seen on Angela Walter's blog). I was convinced that the quilting would be a nightmare and drag on forever but the opposite was the case. It took me literally only two longish evenings. My plan to quilt in quadrants with a few guiding lines worked a treat. 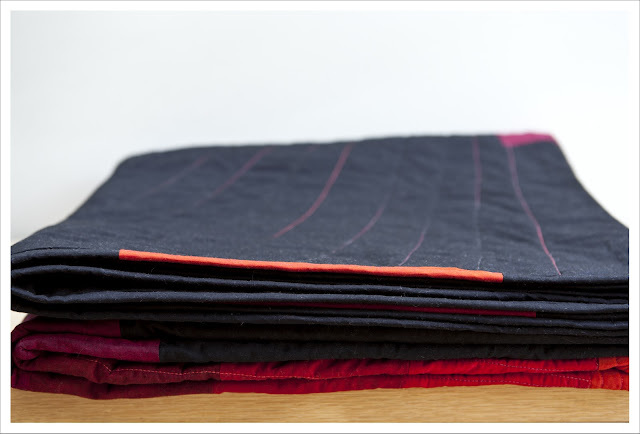 After I had quilted six or so lines I was able to use these as guides to fill in the remaining lines. At first I started out each line from the middle of the quilt because I thought it would pucker otherwise but soon changed tack and started from the outset which worked just as well and was somewhat easier. I also changed tack in terms of tidying up threads. First I planned to tidy up each thread by hand later but I realised that the Valdani thread isn't as strong as Gueterman Sulky or Aurifil and often a gentle tuck on the thread to bury it with a knot leads to it breaking. So I changed instead to sewing a few stitches in place by machine and then cut off the thread (my Horizon does this rather neatly). 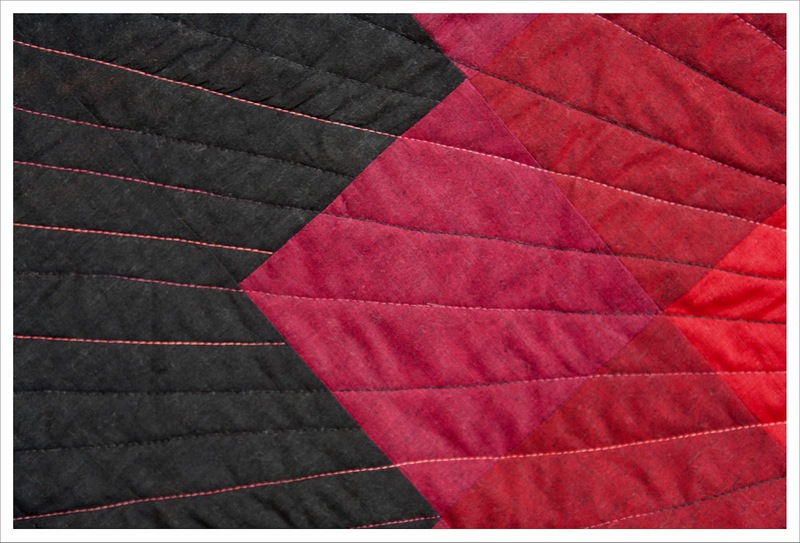 I used both thread colours throughout the quilt (but did the middle square entirely in 'Vibrant Red' ) to ensure that there were some highlights in the black. I loved the 'Red Eclipse' thread as it really gives the impression of star bursts with the black parts disappearing in the black background and the red parts standing out. 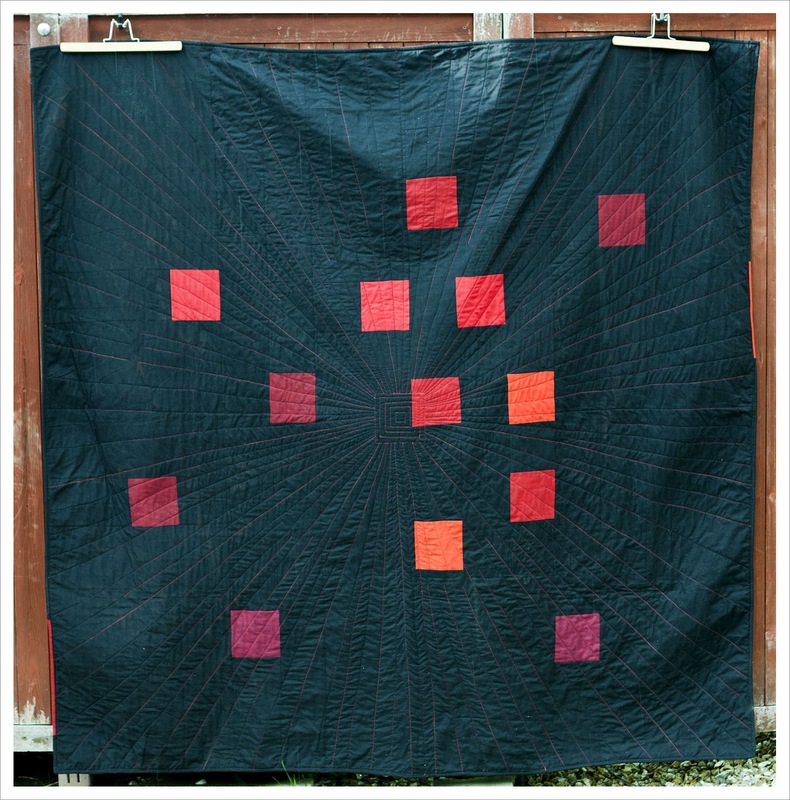 I also chose not to quilt all lines through from the outside to the centre because I did not want the centre to be overly crowded with quilting lines.Some lines I stopped at the beginning of the red pattern. Well, and this is the back. Due to popular demand and on special demand by Sarah I chose this pattern. Actually what clinched it was Jennie's comment that it would look like a before and after shot of the comet approaching and exploding (thank you Jennie). I am really, really happy with this choice and sometimes even prefer the back. 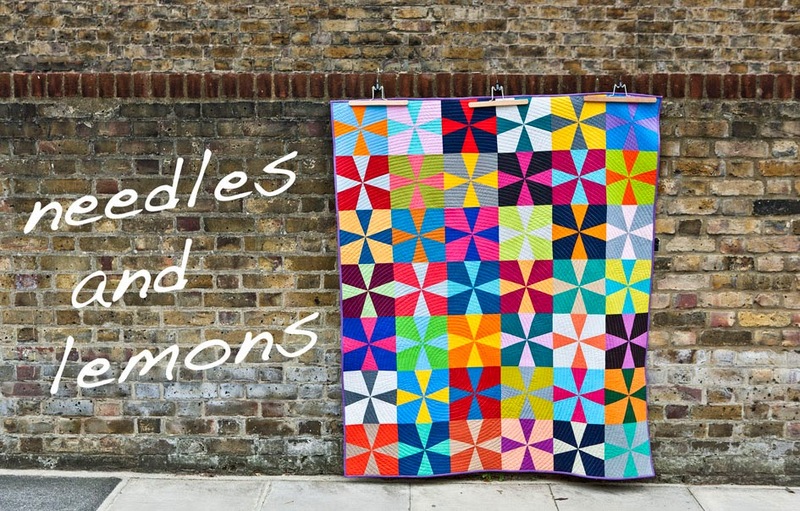 The material is all Oakshotts and the list of colours can be found in the first post here; other posts regarding this quilt can be found here and here. The binding really was a no-brainier. I chose black with two intersections of red to further the impression of the comet coming and exploding. Yes, you are an overachiever! We teased because it is fabulous and huge! Especially compared to all the other challenge pieces! I love it! The back is perfect as are the thread colours and the quilting. 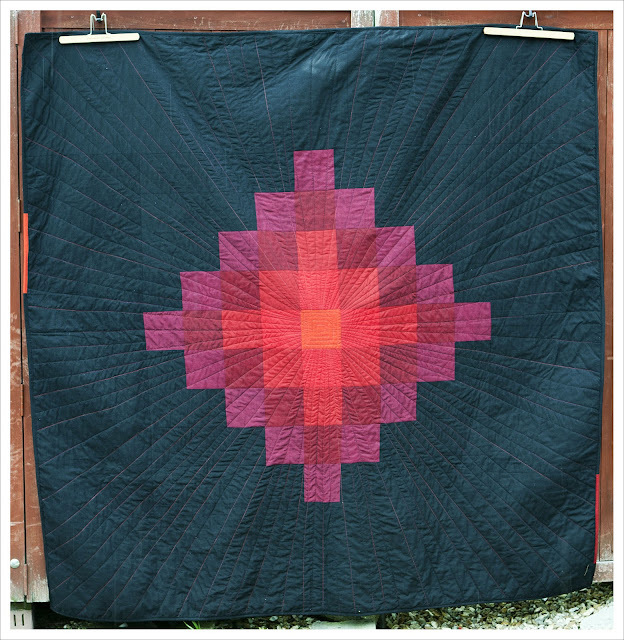 A beautiful modern quilt for sure. It was even more impressive in person! Love the variegated thread and the whole effect of the quilting. Boom! This is really beautiful. I love the way the colours interact and the effect of radiating light. That is an absolutely stunning quilt. I love it! fabulous!! I love the front/back, the quilting is brilliant! Oh this is just fantastic Judith! 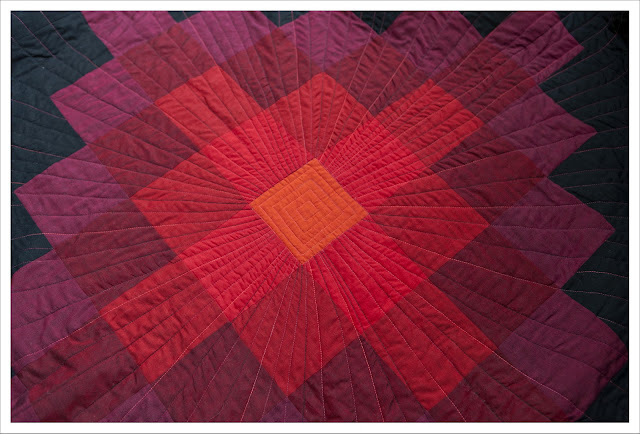 The quilting just makes it! Genius! Looks great, what a job! Beautiful! I love the back too, such a great simple design to reflect the front. 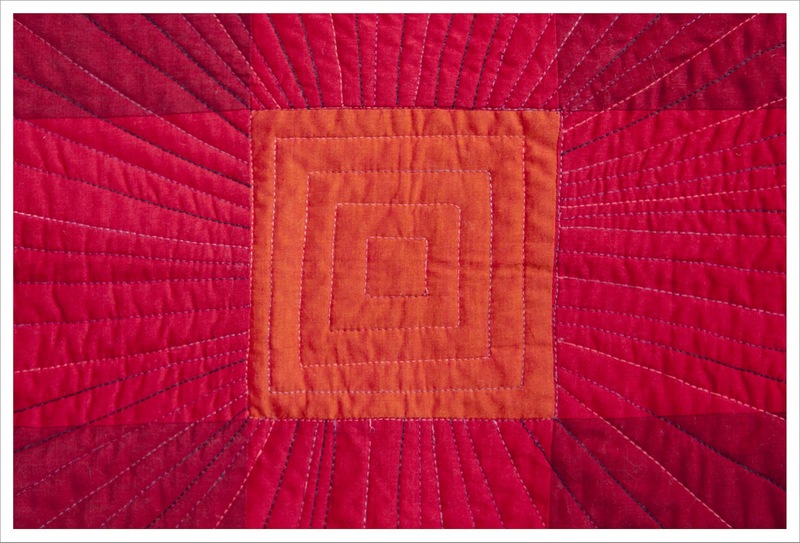 You did a fabulous job quilting this! Its wonderful! I love it, and (you'd know already) I love the back even more! I love it! It looks amazing!!! It really is stunning - well done! How can you bare to part with it? Looove it. It's turned out amazingly! Absolutely stunning.